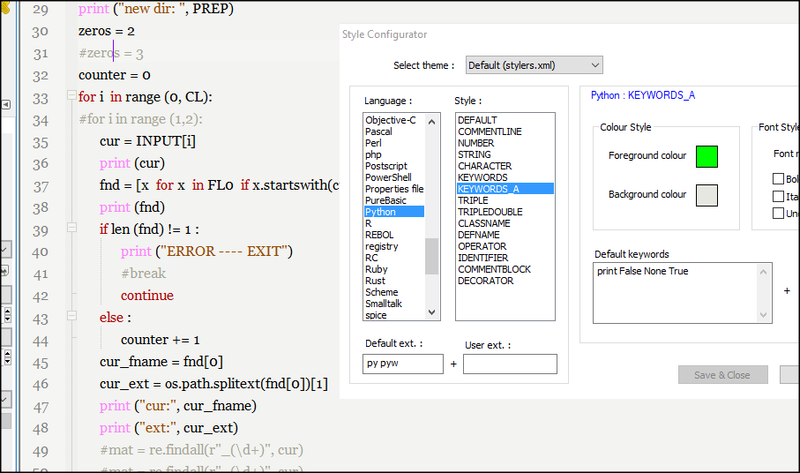 Use built-in Python language configurator (in Style configurator -> Python). Use “user-defined languages” method to define syntax manually. they are all in one big group and I cannot define different styles for separate keywords. E.g. print, True, False, etc, should have different color, but how can I setup them separately? Is it true it is impossible to do with built-in Python lexer? If so, any plans to improve that? So I have googled that and found that “User defined language” method. been made a bit easier. on this and the answer is that it is not possible. This is really sad. Also I cannot find how to highlight def function name. the information about indent? is it planned to include Python folding in the library? when next line indent is bigger, then include in fold, otherwise stop fold. I personally like customizing but still folds are useful especially for 'def’s and long if-blocks. Am I missing something which can improve one or both methods? There are several piece which need to work together. First you need to checkout if the builtin lexer supports multiple keyword sets. In LexPython.cxx we see, that the python lexer supports two sets. name it instre2 and provide the list of words (in sorted order). styleID number and, most important, add the keywordClass tag with value instre2. and stylers.xml there appears a new styler group under Python language, but the keywords in “instre2” list appeared in black color. If I change the new styler color it does not affect the look of keywords. And one additional group is not enough anyway. I need some 4 groups at least to optimize the look. meaning e.g. you have to use unique comments as closing folding identifiers. solution, because I can adjust the chunks I want to fold manually. Not named but another solution might be to use python script plugin. You get all that you need to write your own lexer. It might be not as fast as the builtin ones but you get the possibility to add additional features. Interesting, I’ll look into it somewhen. strange, could you post your langs and stylers.xml? So “KEYWORDS_A” appears in the configurator with keyword list, but the color is not linked to highlighting. looks like the used styleID is the problem. 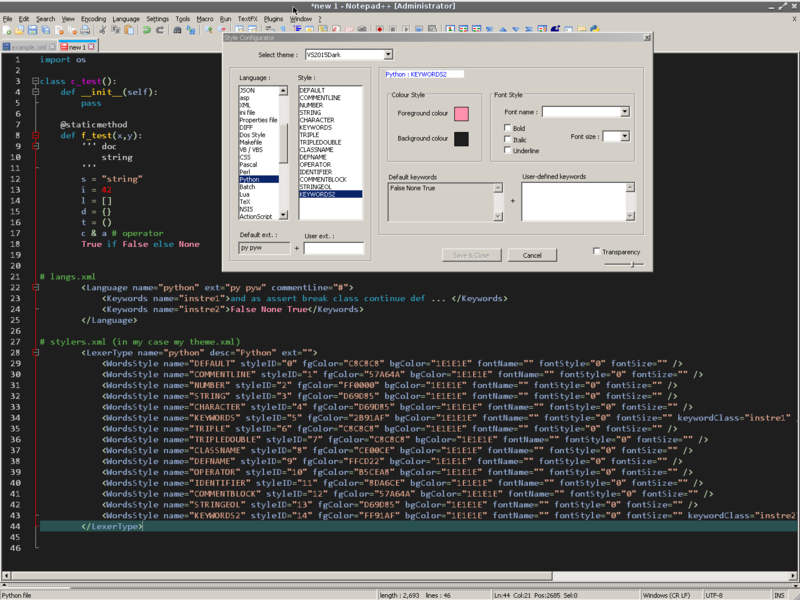 but if I use styleID=14 for keywords_a then it is working. To be honest, not sure why this happens. Maybe it is used internally (didn’t check source code). Yes you are right. With styleID = 14 it works. By the way, what is this mysterios style : WordsStyle name=“CHARACTER” ? It does not change anything if I change its color. I have Local Conf mode ON, from zip archive. had to smile because I’ve asked myself the same question as I first discovered this. doublequoted strings are string style and singlequoted strings are character style. But still not sure where this comes from. I may be offbase here because I’m not really following the conversation, but what this reminds me of is C/C++ where doublequoted runs of characters are null-terminated “strings” and single-quoted single elements are “characters”. might be or maybe someone asked just for a feature to handle single quoted string independently.